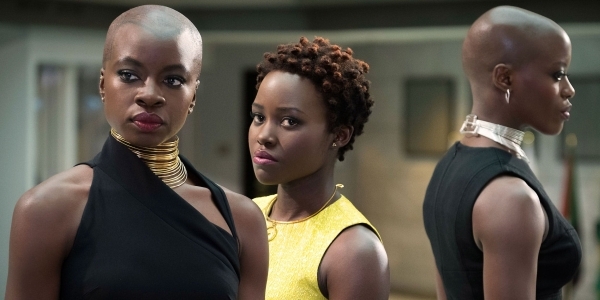 Why does Okoye wear a sleeveless dress? Ruth E. Carter tells a wonderful story that shows how quickly things can and need to change in the costume department. She tells about when they were getting ready to film one of the final scenes in the movie at the United Nations. It was shot nearly on the first day. Gurira plays Okoye, the head of the Dora Milaje. She says that arrived on-set that morning and was called to Danai Gurira’s trailer. Gurira is known for her intense physical presence and especially her muscular and toned arms. In an interview with Self Magazine, she said her arms come from swinging the massive katana on The Walking Dead. 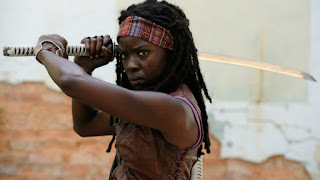 "The exactness and speed with which she wields her samurai sword, or katana, takes not only incredible strength but also perfect equilibrium," says Gurira. "The power comes from the way you pivot your hips. Your feet have to be well placed, your shoulders dropped, your core engaged. And your arms have to be very precise. My katana is solid steel, so it's like swinging a 5-foot-long dumbbell." The black dress covered her arms. The dress at present was a long tight silk jersey with long sleeves! And they were [already] on set. Without a second glance or giving up any “push back”, without any argument, I examined the dress closely and noticed that the design lines of the dress dramatically flowed around the shoulder. I looked at the dressmaker, Tamara, and I said, “Ok [let's] remove the sleeves from here to there.” Time was critical. No time to second guess anything. Gambling again, off the dress went. Both sleeves came off in an instant. Tamara’s hands were shaking the whole time as she sewed and cleaned up the edges. We had to work very fast. It was a miracle that Lupita’s fitting went so well. That gave us time to work out Danai. And both dresses turned out beautifully. It was a purely an instinctual move and a big risk that paid off! What do you think of the Black Panther costumes?